I got to see the preproduction offices for Guillermo's next Hellboy movie when Mike and I had lunch a week ago to talk a little story for the next Hellboy Animated. The design work being done is incredible but that shouldn't be a surprise if you've seen stills of Pan's Labyrinth... which is only about a month away. It's like a little clubhouse for the cool kids. talking story we talked about the advance reaction we were getting to Sword of Storms. Thank you all for your compliments, by the way. The internet response has been overwhelmingly positive. I hear your frustration with not being able to buy the DVD yet. Even the people who didn't love the movie had good things to say about it. Christopher Drake's score was considered very strong by most viewers. We're investigating the option of putting it out as a customer premium when you purchase the DVD at certain stores. I've heard bits and pieces of the score for Blood and Iron and it's just as strong - yet completely different as is the movie. So I was talking to Mike about the action sequences between Liz and the big monster. Relax, no spoilers follow. Those sequences were both rushed and late. You think you're standing back and looking at the whole but you're too close to it and there's no time to re-conceive it. There's plenty of nice action in those sequences but they feel repetitious. There's not a strong build. Mike responded by describing several sequences out of the Abe Sapien mini-series he's writing. Jaw droppingly good - exciting, weird and hilarious. It was an extended action sequence with little dialogue. It broke up the action into separate kinds of action - confrontation, chase, confined space, surprise revelation, etc. Applied to the Liz action sequences - maybe the thing should have chased them onto shore, maybe the geography could change - instead of them always looking up at the thing, maybe they could've climbed higher and be looking down for one of the sequences. The fire effects were too even. There should be a little fire the first time, then more then when Liz finally unleashes the damn island should've started to melt - she and the monster could've disappeared in a cloud of steam as the lava hit the water. Woulda. Shoulda. Coulda. That's not just the value of hindsight, it's the value of time. As I wrote in an earlier entry - in live action, every effects shot is the result of a literal meeting between many department heads so that the shot is done efficiently and safely. There's no way a moment like that gets short change. What does all this introspection help? The next movie. Not Blood and Iron, that ship sailed long ago. We're getting in the final footage now- painfully late, but great looking. No, I mean the third, un-greenlit movie. The new script will be written with the lessons learned fresh in my mind and the fan reaction we've had to the first movie. ANOTHER one? Sweet dog! While still not greenlit it is exciting that you are already thinking about it and making notes of things to make it even better. I see what you are getting at in that sequence and I agree with your points. Given an infinite amount of time and endless resources I am sure the film would have been even better, though it never would have been completed as I am sure, like most artists, you are never 100% satisfied. For the time and resources you had I think you worked wonders and it turned out great. Even better than I had expected. I look forward to your uopdates on the progress of all things Hellboy animated. wow...I really really hope a third one happens tad...That would be perfect. A trilogy would be ideal....and better yet...a continuing series. NOOOOOO I HAVENT SEEN THE FIRST ONE!!!! DVD SHOULD BE RELEASED EARLIER, DECEMBER WOULD BE PERFECT!!! CANT WAIT TO SEE IT. BTW: here in mexico we already had pan's labirynth in teathers and i must say its PERFECT, guillermo has very high standards to top with hellboy2, wich i'm sure he will top above and beyond!!!!!!!!!! awesome time to be a hellboy fan! Yes we need a trilogy at least,I cant wait for the DVD gonna be so cool. I've been walking around with a Hellboy tattoo on my left forearm since 2000'so that should tell you how big a Hellboy fan I am...and this fan can't WAIT for the next movie and the DVD release of SWORD OF STORMS!! !Especially loved the vignette based on Mike's story "Heads"...and VERY pleased that Cartoon Network kept in every "Oh,CRAP!" and "SCREW THIS! "...just wouldn't be Hellboy without them. watched SOS the other day, although it took me some time to appreciate the look of it i felt it was a successfull stab at bringing the big red one to life in yet another medium. doug jones was great in it too! 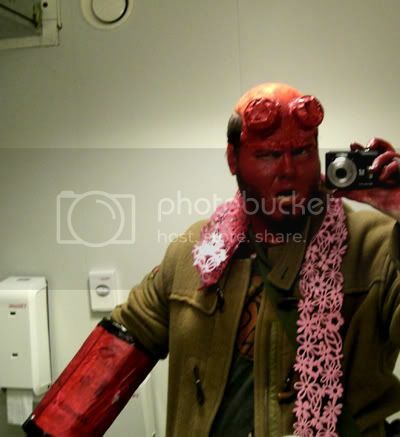 i have high hopes for the next one(s), and that's coming from a guy who went as hellboy on halloween. PS TAD...will the releases for the dvd be a worldwide one in february..or is that only for the states? Why would CN not be rerunning Hellboy? If they aren't planning on running this several times, why would there be such a delay until the release of the DVD? I understand that you would delay the DVD so CN could get some milage out of showing the feature on their network but it appears they are treating it like the redheaded stepchild at a Thanksgiving dinner. One showing, no hype, and no mention of a reairing. Could you enlighten us, oh wise one? 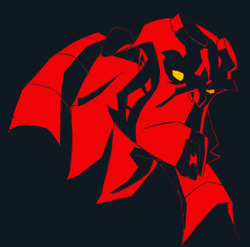 Although I was one of the few dissenters on the Hellboy.com Messageboard (yeah, Sword of Storms just didn't connect with me), I have nothing but high hopes for future Hellboy animated films. Through your blog's Tad and your time on the Messageboard community, I can not only sense but see how hard you and your teams are working to make these films the best they can be. That effort speaks volumes. As a consumer I can complain all day long, but to see you actually take those complaints/compliments and turn them into something positive for future Hellboy movies is, to say the least, encouraging.